The olive tree is native to the Holy Land since ancient times, when its oil was used for nourishment, healing, and the anointing of prophets and kings and as fuel for the temple lamps in Jerusalem. Today, Christians in Bethlehem carve their cherished olive wood to remind us of Jesus, Mary and the story of our salvation. 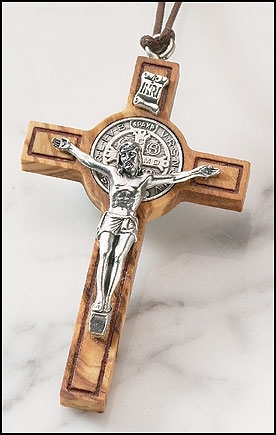 This St. Benedict crucifix, a visible reminder of Jesus' love for us, features the Saint Benedict medal in the center of the cross. When properly blessed by a priest, this medal carries the Church's special indulgence and is a popular devotional for many.